It is composed of fine dried grasses, which are more carefully arranged towards the interior, and is lined with a few delicate fibrous roots, dried moss, or horse-hair. There are seldom more than four eggs, but two broods are raised in the season. The nesting season for most of our birds is winding down, so I was pleasantly surprised to get a call last week from my friends, Jan and Alvin, saying she had discovered an active Blue Grosbeak nest on their property. 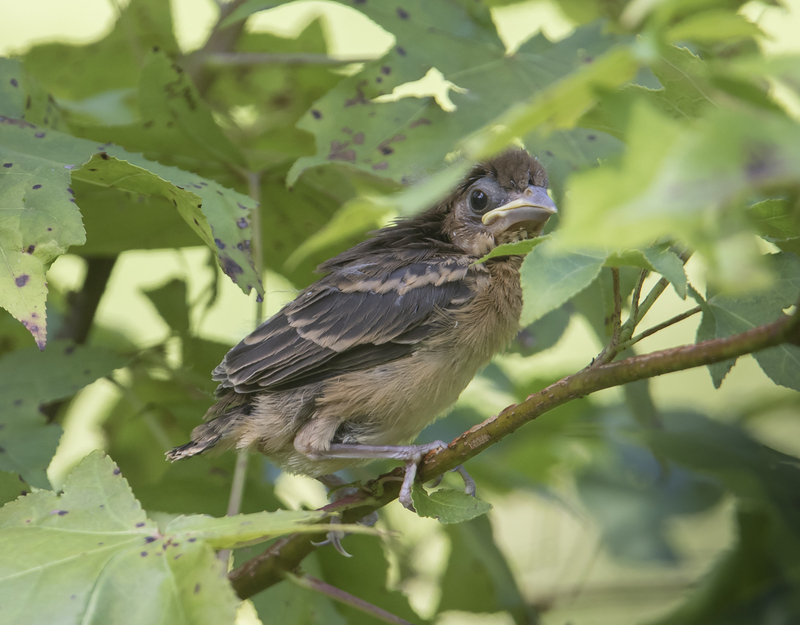 The nest was low in a Sweetgum sapling in a grassy area near a large patch of woods. I went over one morning and set up my pop-up blind backing up to a stand of Sweetgums about 25 feet from the nest. I decided to abandon the effort when the sun came up over the nearby woods and created unfavorable lighting conditions. Plus, the adult birds seemed nervous with the addition of what must have looked like the sudden growth of a dome-shaped tree in their territory. A few days later I returned and set up a camouflage netting wall inside the stand of Sweetgum trees, reasoning that this blended in better than the huge pop-up blind. I then departed, returning the next day for another try at the quickly growing young grosbeaks. Sure enough, the adult birds seemed to accept me sitting behind the camouflage netting and came and went continuously for the next couple of hours while I tried to get some footage of what they were bringing to feed their nestlings. The nest was about 4 feet off the ground in the fork of the sapling. I could see a piece of snake skin (look closely at the upper right portion of the nest) that had been incorporated into the nest. This is a strategy many types of birds use (for example, Great Crested Flycatchers and Carolina Wrens) as a possible deterrent to predators. Researchers in Arkansas found the use of sloughed Black Rat Snake skins did serve to deter predation of artificial nest boxes, especially from mammalian nest predators like flying squirrels. Blue Grosbeaks are another species known to frequently use snake skins in their nest construction. The gusty winds had calmed a bit by now, and this escapee moved nimbly on the twigs above the nest while the remaining two chicks chirped incessantly. The parent birds now have their work cut out for them….keeping up with their kiddies as they explore the area near the nest. 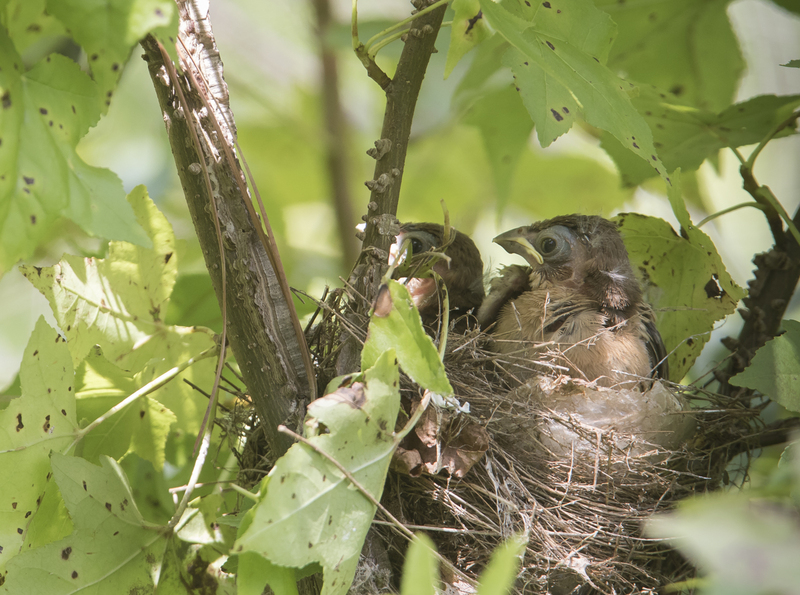 Unfortunately, my camera battery ran out soon after the second fledging, so I decided to pack up my gear and let these birds get on with the business of raising a family. While I did not get the quality footage I had hoped for in terms of documenting what the parent birds fed their young, I did witness an incredible moment in the life of a young bird, their first venture into the world outside the security of their nest. Having shared a few hours with these beautiful birds, I wish them well in their grand new adventures. This entry was posted in Natural History, Nature Photography and tagged blue grosbeak nest by roadsendnaturalist. Bookmark the permalink. Fascinating stuff, Mike! Love the video! Thanks, again, for sharing. Loved it Mike ! A rare opportunity to observe and capture the two fledgelings, especially on video. Thanks, Sam. One of the few times I have witnessed young birds leaving the nest…very cool.